Our laboratory makes a concerted effort to publish our findings in respected academic journals and present at regional, national, and international conferences. In addition to contributing to collective body of knowledge in a given field, presenting original data at conferences is a fun way for the lab's students to enhance their self-confidence and network with other scientists. Dr. Stock and Rob MacLennan stand next to their poster at the 2018 NSCA National Conference in Indianapolis. Dr. Stock presents at ISEK 2018 in Dublin, Ireland. Dr. Stock with friends and colleagues Joshua Carr, Xin Ye, and Jason DeFreitas at ISEK 2018 in Dublin, Ireland. University of Oklahoma Ph.D. student Joshua Carr presents data at the 2018 ISEK conference in Dublin, Ireland. Lab members take photo following the 2018 NSCA National Conference Awards Banquet. 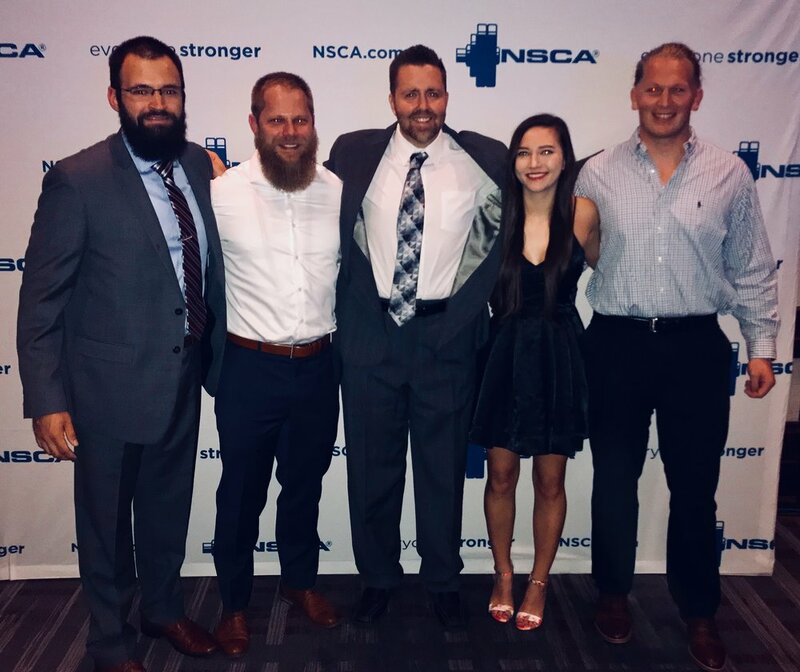 Students Rob MacLennan and Alina Swafford and Dr. Stock at the 2018 NSCA National Conference in Indianapolis. Dr. Stock poses with his friend and mentor, Dr. Lee Brown, at the 2018 NSCA Awards Banquet. Dr. Stock is named a Fellow of the NSCA in Indianapolis in 2018. The NSCA has over 45,000 members and 75 Fellows. Dr. Stock with Ph.D. student Micheal Luera and Dr. Jason DeFreitas of Oklahoma State University. Adam Burton (left) and David Phan (right) presented research at the UCF Showcase of Undergraduate Research Excellence (SURE). Dr. Stock presented at the 2017 Experimental Biology Annual Conference. Lab member Adam Burton recently presented research at the 2017 Florida Undergraduate Research Conference. 1. Burton, AM, Stock, MS. Consistency of novel ultrasound equations for estimating percent intramuscular fat. Clinical Physiology and Functional Imaging. Accepted May 17, 2018. Visit publication page. 2. Stock, MS, Whitson, M, Burton, AM, Dawson, NT, Sobolewski, EJ, Thompson, BJ. (2018). Echo intensity versus muscle function correlations in older adults are influenced by subcutaneous fat thickness. Ultrasound in Medicine and Biology, 44(8):1597-1605. Visit publication page. 3. Carr, JC, Stock, MS, Hernandez, JM, Ortegon, JR, Mota, JA. Additional insight into biarticular muscle function: The influence of hip flexor fatigue on rectus femoris activity at the knee. The Journal of Electromyography and Kinesiology, 42:36-43. Visit publication page. 4. Thompson, BJ, Whitson, M, Sobolewski, EJ, Stock, MS. The influence of advancing age, joint angle, and muscle group on strength production characteristics at the knee joint. Journal of Gerontology: Series A (Biological Sciences), 73(5): 603-607. Visit publication page. 5. Valipoor, S, Pati, D, Stock, MS, Bazuin, D. Safer chairs for elderly patients: design evaluation using force and electromyography measurements. Ergonomics, 61(7): 902-912. Visit publication page. 6. Thompson, BJ, Whitson, M, Sobolewski, EJ, Stock, MS. Effects of single vs multiple-joint strength tests on age-related maximal and rapid strength capacities. International Journal of Sports Medicine, 39: 124-132. Visit publication page. 1. Stock , MS, Mota, JA. Shifts in the relationship between motor unit recruitment thresholds versus derecruitment thresholds during fatigue. Medical Engineering & Physics, 50: 35-42. Visit publication page. 2. Thompson, BJ, Stock, MS, Mota, JA, Drusch, AS, DeFranco RN, Cook, TN, Hamm, MA. Adaptations associated with an after-school strength and conditioning program in middle-school aged boys: A quasi-experimental design. Journal of Strength and Conditioning Research, 31: 2840-2851. Visit publication page. 3. Mota, JA, Stock, MS, Thompson, BJ. (2017). Vastus lateralis and rectus femoris echo intensity fail to reflect knee extensor specific tension in middle-school boys. Physiological Measurement, 38: 1529-1541. Visit publication page. 4. Mota, JA, Stock, MS. Rectus femoris echo intensity correlates with muscle strength, but not endurance, in younger and older men. Ultrasound in Medicine and Biology, 43(8): 1651-1657. Visit publication page. 5. Thompson, BJ, Stock, MS, Banuelas, VK. The effects of an accumulating nursing work shift period on performance-based fatigue using multiple maximal and explosive strength measurements in day and night shift nurses. Human Factors, 59(3):346-356. Visit publication page. 6. Stock, MS, Mota, JA, Hernandez, JH, Thompson, BJ. Echo intensity and muscle thickness as predictors of athleticism and isometric strength in middle-school boys. Muscle & Nerve, 55(5):685-692. Visit publication page. 7. Stock, MS, Mota, JA, DeFranco, RN, Grue, KA, Jacobo, AU, Chung, E, Moon, JR, DeFreitas, JM, Beck, TW. The time course of short-term hypertrophy in the absence of eccentric muscle damage. European Journal of Applied Physiology, 117(5): 989-1004. Visit publication page.